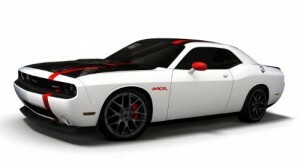 Chrysler and Mopar will be unveiling a very special Challenger at this year’s SEMA show in Las Vegas, Nevada. The Challenger ACR is a no-frills homage to the original option-delete cars of the 1960s and 70s, and is inspired by the success of the Mopar Drag Pak Challenger and more recently, the Dodge Viper SRT10 ACR. Equipped with Mopar parts, such as a coil-over suspension, front-and rear-strut tower braces, short-throw shifter, front splitter, cat-back exhaust, custom exhaust headers and a set of Goodyear F1 Supercar performance tires, the Challenger ACR is an animal that has as much bark as its cornering bite. Performance enhancements in the interior include carbon fiber door panels, front race bucket seats with openings for a racing harness and the rear seat is removed and replaced by a roll bar and fire extinguisher. An SRT three-spoke flat-bottom steering wheel, SRT gauge cluster, custom bright pedal kit, Mopar Drag Pack center stack and a carbon fiber center console finish off the interior modifications. The exterior has design cues similar to those found on the Viper SRT10 ACR, including a white body, charcoal painted roof, carbon fiber hood, rear deck lid, rear spoiler and tail lamp surround and an offset flame red stripe that runs the length of the car. Red painted mirror caps and brake calipers, unique black painted five-spoke 20-inch alloy wheels and red “ACR” fender badging finish off the exterior design details. The white and red theme carries over to the interior with white accents on the carbon fiber door panels, red armrest bars with white foam padding, red door latch release tethers, red painted roll bars and red accents on the carbon fiber racing seats covered in black Katzkin leather.